No one knows for sure how long the Inuit have been playing their specific style of football called Aqsaqtuk, which literally means soccer on ice. 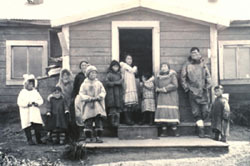 However the game has been mentioned in the myths and legends of the Inuit for hundreds of years. One belief of the Inuit is that the spirits of the dead travel to the northern lights where they play an eternal game of football using the head of a walrus as the ball!! The game of Aqsaqtuk is played between two teams (of varying numbers) who line up to face each other at kick off. The ball is kicked between the lines until it crosses one line of players….then all the players rush to kick the ball into their opponent’s goal. The length of the pitch can vary dramatically – there is a legend, which tells of a game between two villages that had goals 10 miles apart!!! The football is made of animal hide and whale bones. It is stuffed with hair, moss, feathers and wood shavings. The two teams were normally named after birds. In most cases it was the ptarmigans (an arctic bird similar to a grouse) versus the long-tails. In summer, the two teams would play a game with the long-tails playing towards the water and the ptarmigans playing towards land, their favoured habitat. The two sides would also engage in song battles, with the players trying to outdo each other and embarrass the other team. After the game, celebrations would be held in a large communal igloo called qaggi.